Glossary of common stair terms. Balcony Height – The vertical distance from the finish-floor to the top of the level railing. Baluster – A decorative vertical member, used to fill the open area between the railing and the floor or tread, adding safety, support and stability to the balustrade. 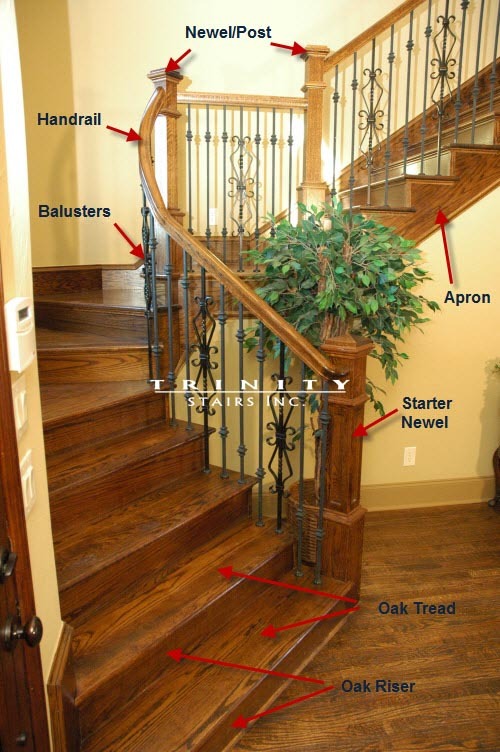 Balustrade – A rail system which includes handrail, newels and balusters. Bending Rail – A rail profile made up of thin vertical strips, or plys, which have been moulded with a tongue and groove bead to create an alignment of the plys. Bending rail offers the ability to glue and bend handrail to a radius to match most curved balustrades. Bent Riser – The riser included in a starting step, curved on one or both ends to form a decorative first step in a stair. Box Newel – A large square newel, usually hollow, used in a Post-to-Post balustrade system. Cap – That part of a fitting which widens in order to sit on top of a pin top newel. Caps are found in a variety of different Over-the-Post fittings. Circular Stair – See Spiral Stair. Cove Molding – A concave shaped molding used to cover the joint formed where the face of the riser meets the underside of the tread. On an open stair the cove molding is continued under the return nosing. Curved Stair – A stair that winds or curves it’s way from one floor to the next. It may be constructed having one turn of direction, or a series of turns. Double Mitered Return Tread – A tread that has mitered return nosing applied to both ends, used in a double open balustrade stair. Epoxy – Type of adhesive recommended to install forged balusters and collars. Fitting – A combination of components that are profiled to match handrail patterns and permit directional and vertical changes with handrail in Over-the-Post balustrades. Gooseneck – A rail fitting used to accommodate transitions in height and/or direction at intermediate and balcony landings. Handrail � The horizontal or rake member of a balustrade system. It sits on top of the balusters and is supported by newel posts. Header – A floor framing member that runs across the well opening. The top riser of the stair is attached to the header. Landing Tread – A structural moulding, used on all landings and balconies, to create a transition between the stair and the finished floor. Level Rail – Railing used on a balcony or a landing. Mitered Return Tread – A tread which has a piece of return nosing applied to either the left or right side for use in an open stair. Mitered Riser – A riser with a mitered edge for attaching to the skirtboard or decorative bracket. Newels � The major support posts for the balustrade system. Larger and heavier than the balusters, newels are located at the bottom and top of a staircase and at turns and critical support areas of balcony rails. Nosing – The rounded edge of a tread. Over Easing – A rail fitting used to transition from sloped rail to level rail without the use of a gooseneck. Over-the-Post – A balustrade system which utilizes fittings to go over newels for an unbroken, continuous handrail. Partial Open Stair – A stair that has an open balustrade that extends only a portion of the way up the stair before running into a structural wall. Plow – A recess moulded in the bottom of handrail and in the top of shoe rail to receive the square top or bottom of a baluster. Post-to-Post – A balustrade system where handrail is cut and attached between square top newels. Rail Plug – A round wood plug used to fill holes drilled in newels and rails, allowing screws or rail bolts to be used. Rake – The angle of ascent, or slope, of a stairway. This is determined by the rise and run. Rake Rail – Ascending handrail of a balustrade – follows the pitch or rise of the stair. Return Nosing – A moulding used to trim the end of a tread on the open side of a stair. Rise – The vertical distance from the top of one tread to the top of the next tread. Riser – The vertical finished component of a stair filling the space between the treads. Rosette - A decorative and anchoring wall plate used to terminate handrail into a wall. Run – The horizontal distance from the face of one riser to the face of the next riser. Shoe Moulding – A convex shaped moulding, usually used where the first riser meets the finished floor. Shoe Rail – A plowed, lineal moulding designed to receive the bottom square of a baluster. Skirtboard – A finished trim board used on either open or dosed sides of the stair as a decorative accent. Spiral Stair – A stair where the treads form a circle around a center point as the stair ascends from one floor to the next. Starting Newel – The vertical post used to start a balustrade system. Starting Step – A decorative first step of a stair, generally designed with a tread and riser which lengthen the step beyond the width of the basic stair. Straight Stair – A stairway with no turns or intermediate landings. Subfloor Rise – The measurement taken from the top of the subfloor of the lower level to the top of the subfloor of the upper level. The total rise of a stair, measured before finish materials are applied. 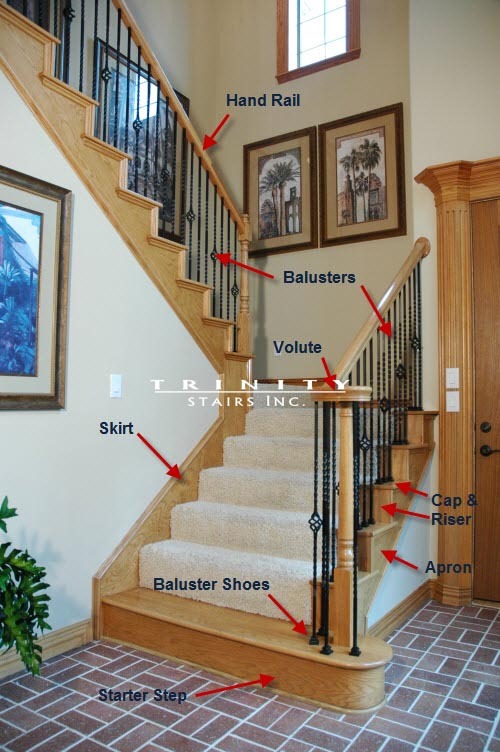 Take-Off – Material list of required stair components for a specific stair. Total Rise – The total vertical distance from finish-floor to finish-floor. Total Run – The total horizontal distance covered by the entire stairway. Tread – The horizontal component of a stair on which one steps. Tread Bracket – A decorative piece mitered to the riser and fastened on the side of an open skirtboard. Tread Nosing – The rounded edge of a tread. Tread Overhang – The portion of the tread which protrudes beyond the face of the riser. The width of the overhang is added to the tread run to obtain tread width. Turnout – A curved rail fitting used as one option to start an Over-the-Post balustrade system. Up Easing – A rail fitting which curves, permitting the handrail to change the slope of the rail system. Up easings are normally used at the top and bottom of Over-the-Post stair runs. Up easings are a component part of all starting fittings and goosenecks. Volute – A rail fitting that scrolls left or right used as one option to start an Over-the-Post balustrade system. Walk Line – The line along which most people walk as they proceed up a stair. Its location is critical to tread depth in winding and/or circular stairs. Wall Rail – Rail affixed to the wall, usually by means of mounting brackets. It may be the primary handrail for a dosed stair or the supplementary handrail to a balustrade system. Wall Rail Bracket – A metal bracket that is used to fasten wall rail to the wall. Winder Stair – A stair that makes a directional change without the use of a platform. Winder Tread – A non rectangular tread used in combination to make directional changes in winder stairs.